My name is Anali Macias and I'm a sophomore Vocal Music Education major. I've wanted to be a musician my entire life. I fell in love with music because I loved singing to God in church. I like singing because it feels good to do so. It makes me feel useful because it helps bring happiness to people. It also can help people feel emotions that normally aren't discussed in society. Music is a language of its own. I graduated from the Las Vegas Academy of the Arts where I studied choral music, opera, mariachi, and handbells. 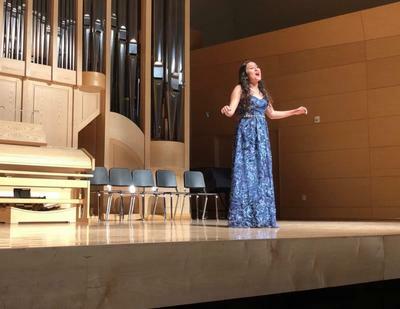 I love being a part of UNLV's school of music. Everyday I feel more sure about my career choice because everyday I feel more prepared to teach future musicians. This Thursday at the choir concert I'll be performing with Concert Singers and Argenta. We're singing Haydn's Missa Brevis. The timeless Latin text goes so beautifully with the gorgeous melodies that Haydn composed. Our choir has put a lot of work into learning and polishing this music and I can't wait to share it with others.